Hey y'all, this is Odie writing. I hope you have had a super week. We have had an excellent week here in Tennessee. I am thrilled we were able to see the Scott Morris family from Mississippi and the Chuck Spencer family from California! We have awesome friends! It has been great to be with the wonderful folks a Beechfork Holiness Church since Wednesday. They are long time dear friends as well. 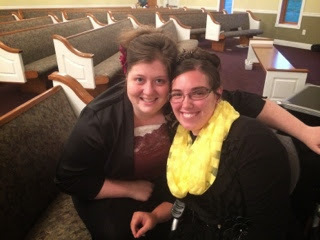 Last weekend I was able to see my friend Alaina Crainshaw in Paducah, Kentucky. Alaina is a great friend. It is not often our paths cross but we love getting together when we can. God has moved miraculously for her since I saw her last. In 2013 she went through a major trial. I asked her if I could share some of her testimony with you. She graciously agreed and wants God to get all the glory. Her testimony has definitely built my faith. I want it to encourage you too. In January of last year paralysis started working its way up her body. When she went into the hospital she could not use her legs and her arms were being effected. She was also having trouble breathing. God moved and the paralysis receded to her waist down over a couple of days. Many were praying for a miracle during this time. Doctors kept her in the hospital for 10 days searching for the cause of this sickness. She was then sent home to undergo therapy at home. The cause was never pinpointed exactly. For 22 days Alaina prayed for a miracle. February 7th 2013 in a revival service her prayers were answered. She was wheeled into the church, but she walked out on her own. She walked, ran, jumped, shouted and did everything she had not been able to do that night. Over a year later Alaina is still praising the Lord for what He did for her! I hope I always remember getting the text of Alaina's healing. I was so excited for her! I know what God did for her He will do for me and you. Nothing is too hard for our God!! Last Saturday in Paducah we had a great service. Dad preached to us on faith. In the altar service the saints were getting help. When they prayed for me my faith was built. I knew God was close that night. It was another building block of faith until I receive my miracle. Bro. Roger Hayes told me that night to go home and read 1 John 5:14-15. When I read the scriptures my heart rejoiced! I have read them several times this week. I know my complete healing is just around the corner. Do not give up praying for God to move in your impossible situations!